The Book A Time feature provides sales reps with a complete automated workflow for booking meetings with customers and prospects. 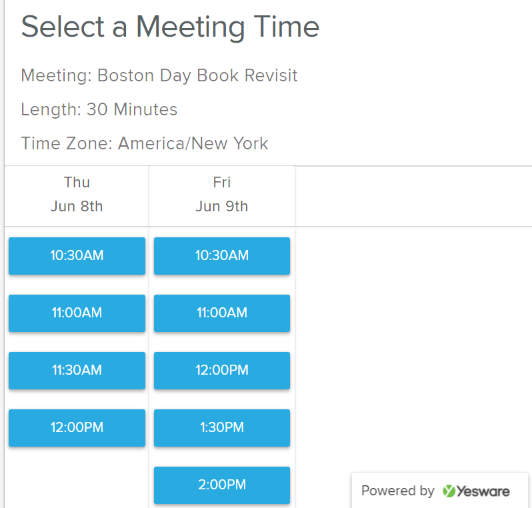 Yesware’s Book a Time eliminates the back and forth emails to book a meeting and provides customers with a list of available times on your Calendar. The feature is available on all plans of Yesware for Gmail. The window will load your calendar and allow you to click and drag to indicate your available times. Give your meeting a title, and optionally specify a meeting length, location, and description. When a recipient books the meeting, all of these fields will populate onto the calendar invite. By default, Book A Time will display your calendar. Using the "Book on Calendar" dropdown, you can switch to another calendar that you have permissions to edit. 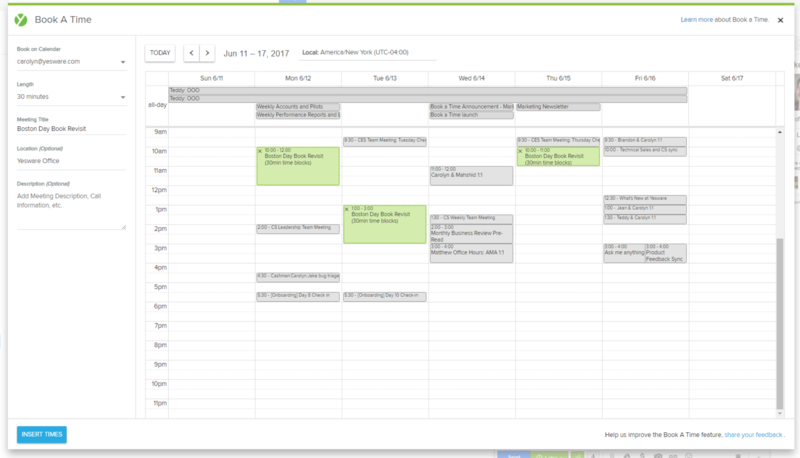 This lets you schedule meetings on those calendars. When you click Insert Times, the available time slots will be inserted into the email message you were composing. When you send this message, your recipient will be able to the click the link that says "Click here to schedule a meeting". They will be brought to a landing page where they can select a specific time to meet. Only time slots that are still available (not busy) on your calendar will be displayed on the landing page. When a recipient selects a time, they will receive a calendar invite for the meeting, and the meeting will automatically show up on your Google calendar. The new calendar event will invite all the people who were on the original email that you composed. Any recipients on the “cc:” list of the original email will be added as optional attendees. If you are on our Enterprise plan, the meeting events will automatically sync to Salesforce. Is Book A Time available to Outlook users?